Martin by his request, he was buried in the Cemetery of the Poor on 11th November. He .is the first non-martyr to be honoured as a saint and he is regarded as the patron saint of France. Summary of St Martin of Tours, Bishop. Born in Pannonia (Hungary) about 316; he died in 397 and was buried on this day in Tours (France). A catechumen who was in conscience unable to continue with military service. Baptised at the age of eighteen, for a time became a hermit, and then worked to establish monasticism in the West. Bishop of Tours for twenty-five years. One of the first non-martyrs to be venerated as a saint. Widely remembered for his legendary generosity to the poor, for arguing against the persecution of heretics, and especially for his active evangelisation and pastoral care of rural areas. 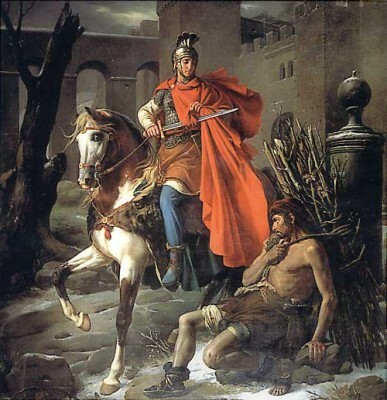 St Martin of Tours is the first non-martyr to be honoured as a saint and he is regarded as the patron saint of France. 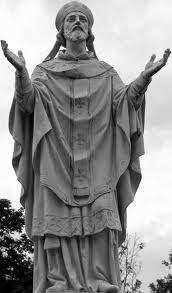 He is also honoured in Ireland in customs and in the dedications of holy wells and placenames, such as Desertmartin in Co. Derry. Patrick Duffy tells his story. Martin was born about 316 at Sabaria, Pannonia (modern Szombathely, Hungary), where his father was an officer in the Roman army. He was named after Mars, the god of war, which his biographer St Sulpicius Severus (360-425) interpretes as meaning “the brave, the courageous”. His father was transferred back to Ticinum (modern Pavia, near the Po river in Italy). At that time due to the conversion of Constantine, Christianity had come into favour in the military camps. However, it was against the wishes of his parents that Martin became a catechumen or candidate for baptism at the age of ten. Soon after this Martin had himself freed from military service, which was then considered incompatible with being a Christian. He was baptised and almost immediately went to Poitiers to become a disciple of St. Hilary (300-367), a wise and pious bishop. At that time Arianism, which held that Jesus (the Word) was created and therefore a lesser being that God the Father, was being promoted by the local Visigothic nobility and threatened the true Trinitarian doctrine. Hilary of Poitiers, because he opposed this doctrine, got the nickname “the hammer against Arianism” (malleus Arianorum). Later some Arians got into power and Hilary was forced to go into exile to Phrygia in Asia Minor, where he allied himself with St Athanasius and other supporters of the true doctrine. Martin meanwhile went to Italy, where the Arians put pressure on him too. Auxentius, the Arian archbishop of Milan, expelled him from the city. He went to the island of Gallinara in the Mediterranean Sea (modern Isola d’Albenga, between San Remo and Genoa) where he lived the life of a hermit. When Hilary returned briefly to Poitiers 361, Martin joined him there and established a monastery nearby which later developed into the Benedictine Ligugé Abbey. From there he travelled through Western Gaul evangelising and many legends of his travels remain. In 371, under the guise of a call to attend a dying woman, Martin was drawn back to the city and was elected bishop of Tours by popular acclaim. Soon he began destroying temples of the Druidic religion, but when he began cutting down the “sacred” trees, the people opposed him. He crossed over to the opposite side of the Loire and founded a monastery that practised a strict regime and drew many disciples. Priscillian was a Christian ascetic and mystic from Spain who held that for a Christian to be in continuous communication with God he had to renounce marriage. He was condemned as a heretic by the Council of Saragossa, he fled. But a Spanish bishop named Ithacius rushed to denounce him to the Emperor Maximus at Trier. Martin also hastened to Trier to ask for mercy and have the case removed from secular jurisdiction. The Emperor at first agreed, but, when Martin had gone away, he gave in to the Spanish bishops and ordered Priscillian and his followers to be beheaded (385), the first Christians executed for heresy. Martin was deeply grieved by this and refused to communicate with Ithacius, until pressured by the Emperor. 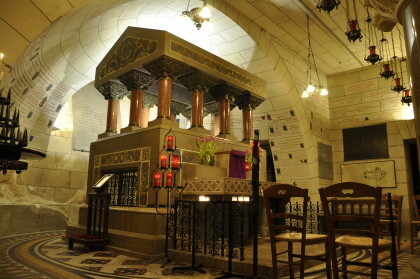 After a visit to Rome, Martin went to Candes, a religious centre he had founded in the diocese of Tours. Here he died of natural causes. By his request, he was buried in the Cemetery of the Poor on 11th November (his feast day). His relics were placed in the cathedral at Tours, which because of his reputation for sanctity became a focus of pilgrimages and reported miracles throughout the Middle Ages. 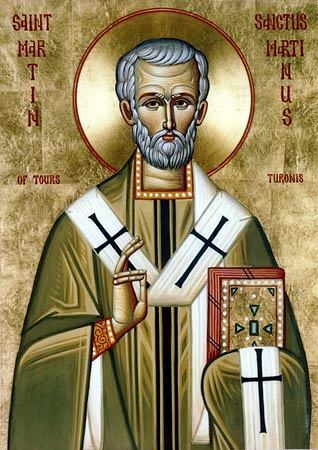 Martin was different from most of his colleague bishops in Gaul at the time. They had moved to the episcopacy from being upper-class leaders in the civil sphere whereas Martin, who resigned from military service to become baptised, was a Christian by conviction. He also had an affinity with the poor and the country people, the pagani, whom he moved out to evangelise. He is a patron saint of France. Because of Martin’s influence in establishing Christianity there (along with King Clovis a little later), France is often refered to as ‘the eldest daughter of the Church’. A number of customs take place in rural communities around the season called Martinmas that are associated with generosity to beggars, cooperation and neighbourliness. For example, a pig or a cow is killed and cooked at this time and shared in honour of Martin. It is also a time for making black puddings and haggis. Martin has also a place of honour in Ireland, especially in the dedications of holy wells and place names, such as Desertmartin in county Derry. A season of mild weather in the middle of November is called St Martin’s summer.